In September 1945, Australian Army officer Major Harold S Williams was sent to Tokyo to investigate POW matters. In a meeting the day after his arrival (28 September) with Huryo Joho Kyoku (Prisoner of War Information Bureau – PWIB), Williams received access to Japanese files which showed that the Montevideo Maru had been carrying Australian prisoners when it was sunk, and included a mimeographed 48-page nominal list in Katakana (Japanese phonetic script) of personnel on board. According to a report he sent back to Australia shortly after, on 6 January 1943 the Japanese Navy Department informed the PWIB of the sinking and forwarded the nominal list, which detailed 848 POWs and 208 civilians on board the Montevideo Maru. According to Williams, this list was ‘the only roll received from the Naval Commander of the Rabaul Base’ [MP727/1, GP25/293 ]. However, it is difficult to determine whether the original list was compiled by Japanese naval authorities at Rabaul or by Osaka Shosen Kaisha, the ship's owner. Williams already had a list of missing personnel from Rabaul. Using this, while in Japan, he transliterated names on the list from Katakana back into English, and completed it after he returned to Australia. Some consider that the process of double translation may or should have raised doubts about the English translation’s accuracy. However, it was on the basis of this list that next of kin were identified and informed of deaths on the Montevideo Maru. The current locations of both the original copy of the Katakana roll and the English translation are unclear, and that one or both have been lost has been suggested. Army official Brigadier David Mulhall told a parliamentary committee in November 2009 that 'the Katakana roll, which we believe to be the most reliable record of who was on the Montevideo Maru when it was sunk, ... has been searched for, for many years now'. 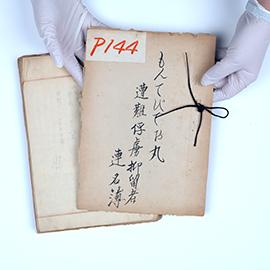 In early 2012, the government of Japan transferred to Australia a number of original records relating to Australian POWs. Included was a document in two parts, one section typed in English, the other handwritten in a combination of Japanese scripts – Katakana (phonetic), Kanji and Hirakana. The list in Japanese scripts is titled 'A Name List of Prisoners of War and Internees who were lost on the Montevideo Maru'. In it are details of 1053 Australians and others (178 non-commissioned officers, 667 soldiers and 208 civilians) who died on the Montevideo Maru. The English list contains the prisoners of war only. It details the name, rank and unit. Some also have their service number. This suggests that this part of the record was compiled by Major Williams, as the Japanese are unlikely to have had access to this information. The Japanese list is on PWIB stationery, and details the prisoners of war as well as the civilian internees. The expert's translation of this document revealed that there are 209 civilians on the list, not 208 as stated at the front of the list, and which has been the figure historically quoted until now. This does not mean that another civilian has been discovered, only that the number historically used was never accurate. Expert historical opinion considers that the lists recovered, translated and sent to Australia by Major Williams in 1945 are likely to have contained the same information as those transferred to Australia in 2012. On this basis, they are likely to be the most complete existing records of those on board the Montevideo Maru. However, as the Minister for Defence Personnel, the Hon Alan Griffin, stated in Parliament on 24 June 2010, 'there is no absolutely confirmed roll'. The list now in the Archives' collection is in two parts, one section in Japanese, the other in English.